Looking for a quiz to host every week, but not sure where to the best quizzes are? Then try our FREE sample now! Below you can find example of our popular Quiz Night pack, made fresh every week with an ‘In the News’ round to keep things current! If the Quiz Night looks a little tricky, then you can also try one of our Quiz of the Weeks, which are a little simpler. Wipeout Round – General Knowledge with prizes for full marks but don’t dare to get one wrong! 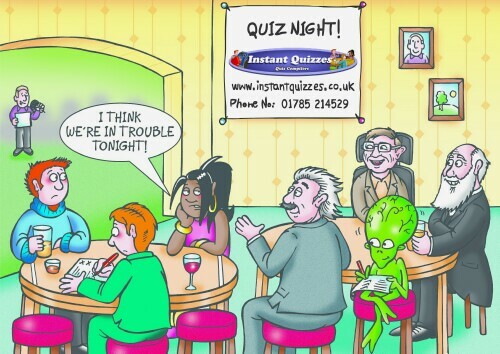 The Weekly Quiz Packs are perfect for pubs who want to hold a weekly quiz bursting with content and sure to entertain. Download our most recent weekly quizzes here or subscribe to get them directly to your inbox for just £2.40 each! For a free sample of our Weekly Quiz Pack download the Weekly Quiz Pack above – just right click on the link and save to your hard drive. For a free sample of our Quiz of the Week download the Quiz of the Week above – just right click on the link and save to your hard drive.